When German warships blocked the import of food to Britain in WWII, rosehips came to the rescue. With no access to oranges, the Ministry of Health needed something to boost the country’s Vitamin C levels. Rosehips can contain 50 times the amount of Vitamin C as the equivalent weight of oranges, and were (and still are) abundant in Britain’s gardens and hedgerows. ‘National Rose Hips Syrup’ became a household item during the Second World War, and over 500 tons of these pretty fruits were used to keep Britain’s Vitamin C levels topped up. Vitamin C, or ascorbic acid as it’s otherwise known, is a water-soluble nutrient found in some foods. It is an antioxidant, helping to protect cells from the damage caused by free radicals. These occur in the body from the food we eat, from air pollution, ultraviolet light and cigarette smoke. Vitamin C helps our body make collagen, which promotes wound healing. It also improves the absorption of iron from plant-based foods, and boosts the immune system, helping us fight off seasonal illnesses. Since it’s water soluble, it needs to be consumed daily, and we absorb it better from food rather than tablets, which often flush straight out of us again. With their rich Vitamin C content, then, rosehips are an amazing door-step answer to staying healthy and fighting off winter bugs. Rosehips are the fruit we see on rose bushes in autumn. They vary in size, shape and colour. Roses are members of the apple family, and the petals and fruit of all roses are edible. They can be used, dried or fresh, to make tea and, when properly cleaned and washed of the inner fluff, can even be added to salads for a delicious zing. While those who have never tried Rosehip Syrup might think it was one of those ‘medicines’ you’re obliged to pull a face at when your mum shoved a teaspoonful into your mouth, it was something kids actually looked forward to. A daily treat before school, rather than a disdained chore to be endured. I make my syrup from locally foraged rosehips each autumn. With so many varieties of roses around, it’s no surprise that the ones I find are not always the long, scarlet berries of the native briar. They come round and fat, pale or dark. I find ones the size of cherries (or even small plums), and some the size of haws (hawthorn berries). They all make good syrup. 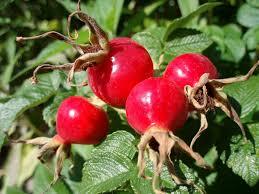 Rosehip syrup does’t have to be taken as a spoonful dose once a day. You can use it drizzled into yogurt, or onto ice-cream or porridge. You can tip a little into hot, cold or sparkling water and take as a drink – use about the same amount as you would use to dilute squash. You can even add it to gin or vodka to give it a bit of something different. Preparing rosehips for syrup is a matter of picking off the dried-up sepals and stalks and giving them a really good wash. However, if you want to eat them in a salad, or add them fresh to tea, it’s necessary to also cut them in half and scoop out the seeds and the irritating hairs surrounding them. The hairs aren’t poisonous, but they irritate, and can cause sore throats. If drying them for tea, you need to chop them up before drying, as once they’re dry the skins become hard, preventing the luscious flavour escaping when you add hot water. Put them in a muslin bag to steep, too, unless the hairs have already been removed. If you’ve never tried rosehip syrup I urge you to give it a go. The roses the hips came from spent all summer soaking up the sun, so this old fashioned remedy is a great way to bring sunshine into a cold, dreary day.